I just learned on the Food Network that only male turkeys gobble, females make a ‘clicking’ noise (no comment from the Madtini Labs crew on that one). Other facts I discovered were: domesticated turkeys have approximately 3,500 feathers and have been bred to be white so that when plucked the feathers leave no discernible mark. 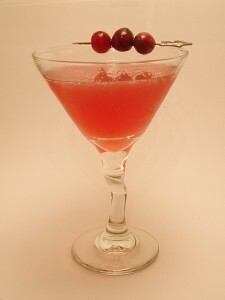 Combine vodka, Chambord, lemon juice and cranberry juice in a cocktail shaker filled with ice. Shake, then strain into the chilled cocktail glass. Garnish with a skewer of fresh cranberries.